The Impressions are an American R&B vocal group originally formed in 1958. In 1964 The Impressions released the "Keep On Pushing" single, which hit #10 on the pop chart. This song was one of the first to reflect an increasing social and political awareness in Curtis Mayfield's writing, and came to be seen as something of a black pride anthem. The album of the same name, released the same year, was their most successful to date, itself charting in the Top 10 and featuring several other hits. 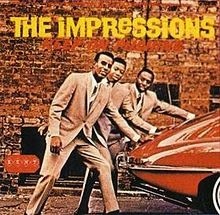 Indeed 1964 was a good year for The Impressions, with four singles getting into the Top 20 on the pop chart. On the Keep On Pushing album, "Talking About My Baby" had actually been a hit the year before (#12 pop). "Amen" was their second biggest to date - a traditional black spiritual set to a marching rhythm, it charted at #7 pop. "I've Been Trying" would chart at #35 R&B the next year. The two other pop hits of the year not included on the album were "I'm So Proud" (included on their previous album) and "You Must Believe Me" (on the next album). Many of these high-charting pop songs didn't actually have a position on the R&B chart - that is because the R&B chart was discontinued at the end of 1963, but returned in 1965. Been waiting for this one! Unfortunately, "File does not exist on this server"